Have you got a sweetie in your life that has a sweet tooth? Well, my husband is in good company then! And since it is Father’s Day, I knew that baking him a pie would be just the thing to bring a HUGE smile to his face! My rhubarb plants have gone absolutely crazy this year and the strawberries are gorgeous, so what else? A Strawberry, Rhubarb and Mascarpone Cream Pie! The father of my children is of ‘the age’ where he isn’t asking for any gifts, but anytime I ask him what he’d like for me to make for him, he’ll ALWAYS ask for something sweet and baked from the oven. Perfetto! My kind of gift! Something to make any father’s tummy happy . . . happy . . . HAPPY! The father in your life will definitely feel the love with this sweet gift. Just look how pretty this pie is BEFORE popping it in the oven! I love to bake and need to bake more often. I’m the savory-preference person in this duo and forget how fun baking something sweet is! In honor of Father’s Day, I’m focusing on something to prepare for the guys in our life, often called “Man Food”! Well, this may not be a huge beef steak sizzlin’ from the grill, but this is man food enough for my guy, plus the gals in my life love strawberry rhubarb desserts too. So everyone wins with this recipe! 1 egg beaten with a little water, about a teaspoon. Place in a bowl of a food processor: flour, salt, and sugar. Pulse to combine. Add butter slices and pulse until the mixture looks like bread crumbs. Whisk together the buttermilk, egg yolk and vanilla in a bowl. Add the buttermilk mixture to the flour mixture in the food processor bowl. Pulse until the crust mixture sticks together in small crumbly clumps. If necessary add more buttermilk if dry, or flour if too wet. Flatten the crust dough into two separate circles of dough and then wrap them individually in plastic wrap and refrigerate for one hour minimum. Combine rhubarb with strawberries in a large mixing bowl. Add sugar, brown sugar, salt, corn starch and vanilla. Stir gently until all fruit is coated. Remove the chilled crust dough from the frig after at least one hour. Place a long piece of parchment paper on the workspace and put one of the dough discs on top and then place another long piece of parchment paper on top of the dough. Using a rolling pin, roll out the dough into a circle that will fit your pie pan with a little extra. Peel off the top parchment paper layer. Be very careful and sprinkle the top of the dough with flour and place the paper back on top and flip it over. With care, peel of the new top piece of parchment paper and carefully place the dough in an unbuttered pie baking dish. Press the crust dough into the baking dish and trim any excess dough off of the sides. Drain the liquids from the rhubarb and strawberry mixture. Scoop the fruit onto the pie crust dough. With the second circular disc of dough, use the same methods above to roll out the top crust layer. Cut strips approximately ½” wide and then weave into a lattice-top crust. Brush the top of the crust with the egg wash. Sprinkle very generously with sugar. Bake for 20 minutes in the lowest rack of the oven at 390 F.
Keep an eye on the crust to prevent burning; place aluminum foil on the top as soon as it begins to look like it is getting too dark and not a golden brown. Reduce the oven temperature after 20 minutes to 350 F and bake for another 40 minutes when the juices bubble and the crust is golden brown. Combine the mascarpone cheese with cream, sugar and vanilla; mix until thickened. Remove pie from oven and allow to cool. Top with the sweet mascarpone cream. Roz, the pie is a stunner! This would make every father HAPPY! Manu, I’d have your wings for dinner and have a slice of this sweet/tart pie for dessert! Happy Father’s Day (early in both Australia and Italy). Thank you so much Liz; I appreciate your baking-expertise feedback! Those pizookies are outrageous too! And a big Happy Father’s Day hug to your Bill! This is the perfect way to celibate the special men in our lives Roz. Awe, thank you dear friend. I loved our live chat the other day! I wish we lived closer to each other for a real in-person long afternoon of good eats and conversation! Can I just tell you — I am drooling just looking at the beautiful photography!! Look at that amazing lattice! I want your pie. That’s ANYBODY food! I love that Dorothy! You’re absolutely spot on! Roz, this looks perfectly golden brown and beautiful. An excellent dessert for the father’s day! Grazie mille, mia bella amica (Thanks a million, my beautiful friend)!! Two visits from you truly made my day happier! Thanks so much Shannon . . . your BBQ Chicken Nachos recipe is the bomb!!! Love it! Such a pretty pie! Strawberries and rhubarb pair so nicely. 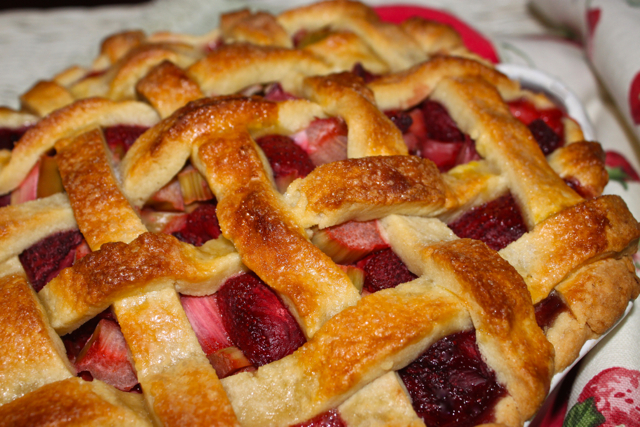 I even like rhubarb by itself in pie too! Laura, I completely agree with your taste preference for rhubarb and strawberries together. Can’t wait to pop over and see what you prepared today! Thanks for your kind compliment, Shaina. I love lattice-topped pies, and they are so much fun to weave! Who needs a plate? Just set the whole pie in front of me and give me a big soon. Yummy! You’re too funny Renee, but you want to know the truth . . . that’s just exactly what my husband does! What a perfect looking pie. I LOVE rhubarb so this is right up my alley. Shannon, I appreciate your kindness. This was a fun and easy pie to make. The crust is just the bomb! Hope you try it someday and let me know what you think. Both my husband and I have huge sweet tooths. Huge. And I love strawberry rhubarb pie. Yours looks so gorgeous with the lattice top. Perfect!! Grazie Susan per la complimento! 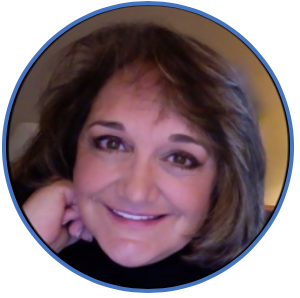 Thank you Susan for the kind compliment. Your husband and you share the similar flavor preferences! I love sweets too, and pie is always a winner! By the way, there’s a ? for amount of cream. I make mascarpone cream with strawberries too, but was wondering how much cream you use? Susan, thanks so much for letting me know about the “?” for the amounts of some ingredients. This has happened before and I don’t know why! I’ll need to do a better job of double checking after it posts. I start with a lower amount of cream and continue to add until the desired consistency that we like. I like mine thicker, but my husband likes his a little thinner. I also like to add more sugar when necessary! Thank you so much for letting me know about the boo-boo and for your visit! That would be so great if you could pop on over Sarah! Mile high rhubarb pie. Yum. Yours looks damn delicious. I love it . . . ‘mile high pie’. It sure did turn out quite large; lots to go around Marlene! Thanks for your visit! 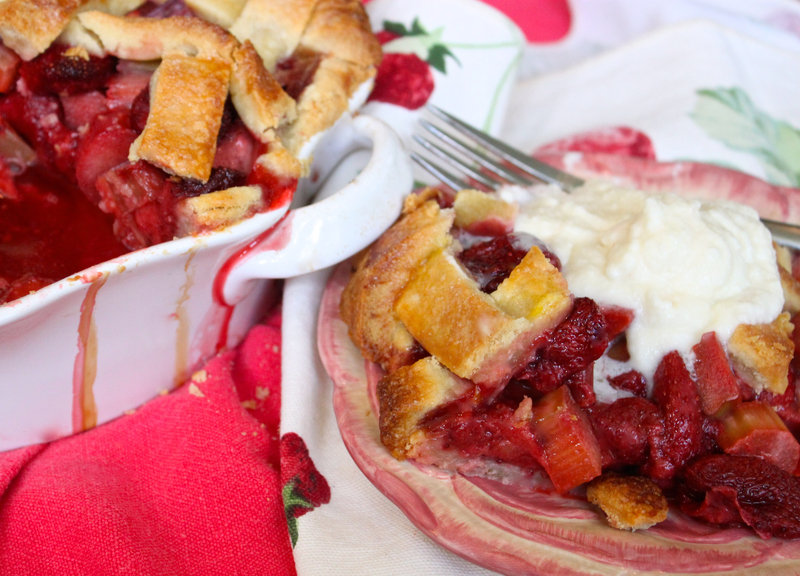 Thanks Rebecca, rhubarb certainly is a pie favorite of many! Now that’s a beauty of a pie! I really must plant some rhubarb. Your lattice top is absolutely perfect. Hi Linda! You must be back from your awesome trip to Italy! I’ve loved following you as you traveled! Thanks for your compliment, it was fun and super easy to do the lattice top! The crust is the best part of this recipe, in my humble opinion! Welcome home! Looks so pretty. The lattice work always reminds me of home. My grandmother made her pies this way too. 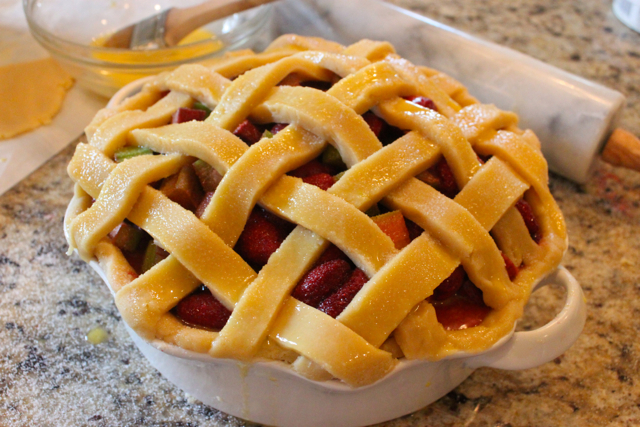 Rhubarb is almost in season here and my husband would love this pie. I agree, there is just something homey about a lattice-crust pie. If you try this pie, please come back and let me know what you think. The crust is marvelous! What a gorgeous pie, that is amazing and my guy would love it!! Thanks a bunch Tara! Guys do love their pies! I call him The Pie Guy as he makes a way better pie than I do! This is gorgeous! I can’t wait to try your recipe! Thank you Jennifer, that’s so sweet! If you try it, please back by and let me know what you think. The crust is amazing! Wow! I don’t think this pie could look any more perfect! And the fact that it came from your garden makes it even better. Isn’t there something so satisfying about cooking with food that you picked yourself? We have been having a lot of fun using the produce from our garden lately, too. We recently discovered potatoes grow well here so have been enjoying those this year. Your husband is so fortunate that you made him such a delicious pie. Thanks for sharing the recipe, Roz! Oh yes, Shari, you got that right–there is something so gratifying about growing and enjoying your own home grown food that you know is clean and pure of any additives! Gosh, you’re lucky with the potatoes, it is one plant that we’ve had so much difficulty growing! Be right over! My husband is the same way! He’ll always request food in place of gifts 😉 Strawberry Pie is my favorite summertime treat! Great men think alike Gwen! Thanks for your kind comment! oh wow! Roz you outdid yourself with this one. It looks divine and so perfect with the mascarpone cream! I WANT A BIG SLICE RIGHT NOW! We make strawberry and rhubarb pie and bars every year it is one of my favourite combinations with rhubarb. My plants too have gone crazy so I think it is time to make a batch. Wow, that looks beautiful! I have been compiling quite a list of rhubarb recipes and this is being added immediately. Ermagawd, Roz, this pie is a stunner. You latticed the top like a total boss! I’m jealous of your pie pastry skills – mine are pretty laughable but practice makes perfect, right? I love everything about this, especially the mascarpone topping. I can imagine you had a house full of very satisfied people after bringing this beauty out! My husbands favorites rhubarb and strawberry! Your pie looks amazing! 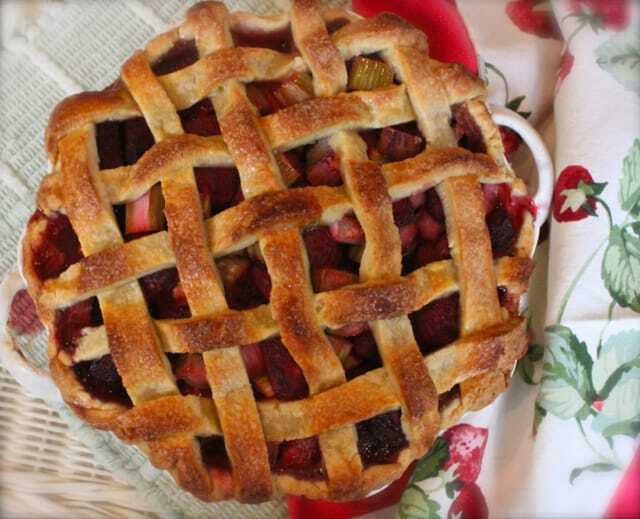 I can’t wait to get my hands on some rhubarb, so I can try this pie!! So beautiful!! that becoming a profitable marketer requires massive overhead investment. and put together a salty “excessive-end” MLM advertising product referred to as MLM Traffic Formula. I have never had rhubarb before. After seeing your pie I know I need to change that fact soon! Wow – this looks delicious – the only change I will make is to sub in my grandma’s crust recipe…I’ve never tried marscapone cream…I bet it is delicious. Hi, I stumbled on your blog by searching for rhubarb recipes on Pinterest – so I live in North East Georgia, zone 8, and I was amazed you are able to grow rhubarb. Is it a perennial where you are? I miss living up north just for that. Any tips and tricks you have for keeping the plants alive in the south would be much appreciated. Or heck, any websites that have helped would be lovely as well.